White pine weevil (WPW) (Pissodes strobi) larval feeding damage is now evident throughout Ohio. Look for brown, wilted main shoots (terminal leaders) with the tips sometimes curved into a "shepherd’s crook." There is one generation per year and localized populations may be reduced by removing and destroying the infested terminals before new adult weevils emerge. WPW has a wide conifer host range that includes Scotch, jack, red, pitch, and eastern white pines as well as Douglas-fir and all spruces. Indeed, the WPWs love of spruce is exemplified by its alternate common name, Engelmann Spruce Weevil. WPW infestations start in early spring when overwintered females lay eggs just beneath the bark of terminal leaders. The resulting grub-like larvae are white, legless, and slightly curved. They tunnel downward feeding on the phloem tissue which kills the main shoots. WPS is capable of killing small trees less than 3' in height, but it does not kill large trees. However, years of successive WPW damage to terminal leaders will eventually create "cabbage trees" which are short, squat trees with multiple terminal leaders in landscapes and woodlots. Of course, loss of the leaders presents a serious production problem in nurseries and Christmas tree plantations. WPW is common to the northeast part of the state and the weevil is becoming more common to central and southern Ohio. However, lack of experience with WPW may cause the damage to be misdiagnosed as symptoms of other problems such as root injury or drought stress, or the symptoms may go unnoticed allowing localized populations to expand. Tips on Pruning Right Now to Remove WPW Larvae. The goal behind pruning infested terminals is to eliminate the WPW larvae. It's important to destroy the infested terminals because the larva can complete their development with new adults emerging from pruned terminals left on the ground. In general, the extent of the downward larval tunneling is related to both the conifer species as well as the size / age of the host. However, there is no "general rule" to predict just how for the larvae will tunnel so they can be successfully removed through pruning. It is best to start pruning just below the upper-most whorl of lateral branches and closely inspect the cut ends as you make successive cuts downward on the main leader. Larval tunnels appear as round to oblong holes in the phloem ring that are filled with reddish-brown frass. If the cut end of the part of the leader being removed is clear of these holes, the larvae have been isolated. If holes are evident, you will need to make another cut further down on the main leader. Don't be surprised if you need to make several cuts to remove all of the WPW larvae. As the WPW larvae near the completion of their development, they form so-called "chip cocoons" by excavating tub-shaped chambers in the xylem and surrounding themselves in Excelsior-like wood fibers. New adults emerge through the bark creating small, round exit holes. The adults mate and feed on bud and twig tissue; however, their damage is inconsequential. The weevils then move to the duff beneath conifers to spend the winter. Of course, if you find adult exit holes, it's too late to control WPW through selective pruning. 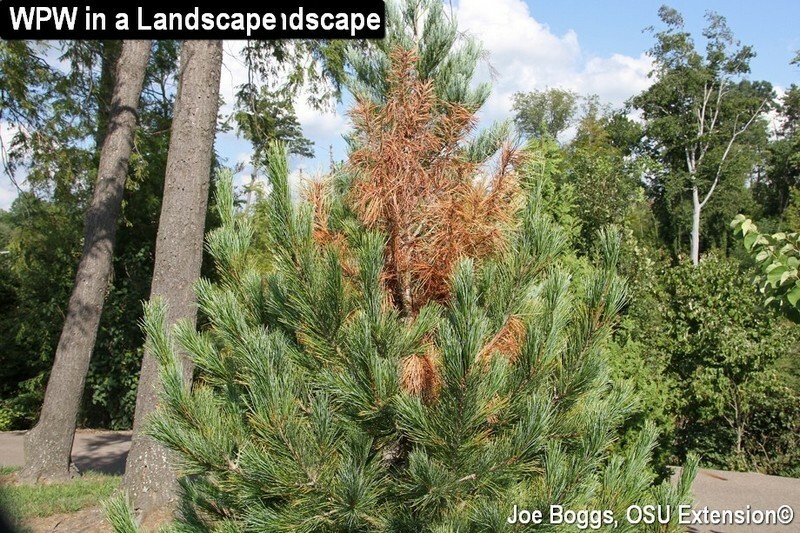 Conifers may be protected against white pine weevil in two ways: by spraying the tops of the trees in early spring or by making a fall application of a systemic insecticide. In both cases, insecticide selection depends on the product label. Both the site (e.g. landscape, nursery, Christmas tree plantation, etc.) as well as the target plant (e.g. conifers) must be on the label. For example, products labeled for use in landscapes may not be labeled for use in nurseries or Christmas tree plantations, and vice versa. Of course, as with using any pesticide, you must read and closely follow all label directions. Spraying the main leaders targets the overwintered adults before they lay eggs; the entire tree does not need to be sprayed. The application must be made once adults start to emerge in early spring which is usually around 84 GDD. Effective products include pyrethroid insecticide such as bifenthrin (e.g. Onyx, Talstar, etc.). Preventative systemic insecticide applications target the overwintered adults by killing the weevils as they feed on the phloem in the spring but before they lay eggs or the systemics will kill early instar larvae as they begin tunneling in the phloem but before they produce serious damage. Systemics such as imidacloprid (e.g. Merit, Nuprid 1.6F, etc.) may be applied using soil drench or soil injection applications. Of course, this preventative control measure should be reserved for landscapes, nurseries, or Christmas tree plantations that have a history of significant white pine weevil activity.